The new edition of the category of the thousand dinars of Surah Al-Ekhlas that existed in all other editions. We saw this coming from an earlier article (interview with CBI Governor) so good to see this validation. At today's rate, these hold values around the dollar, fifty cent piece, and quarter. It's expensive to release these notes and we know the USD is the preferred currency to use. So, at least in my mind, the question that begs is, why? Why release these now? Unlike the gurus (are any left?! ), I'm not going to say this means immediate revalue but this does prove, yes PROVE, that the CBI is obviously full speed ahead with their strategy to return the dinar to being their representative currency. 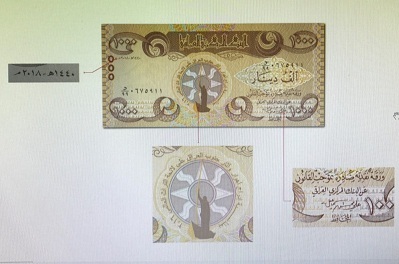 Look at it this way: The CBI must ensure all aspects of the dinar are in place before any significant changes come to the rate -- things like exchange policies and procedures, protections from confusion about the exchange rate, trade and cash balance provisions, and of course currency supply to name a few. All of this must be fully implemented and in place before any significant changes to the rate happens. 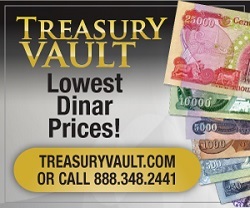 If any aspect of the entire currency reform of the dinar is not fully in place, the repercussions would be significant. This is very encouraging to see and once again, I'm reminded that this is not an "if" but a "when" regarding the dinar gaining strength and surpassing the dollar. The Central Bank of Iraq announced on Thursday, the launch of large amounts of currency for small groups next week. The bank said in a statement received by Mawazine News that it would "raise large quantities of small categories to meet the need for daily transactions and improve the quality of the material used." The bank added that "a simple change will be made in the new form that will be put forward for trading next week, knowing that the deal will be in the old and new form together without discrimination." "Launching large quantities" is curious to me as well. Paper notes have a limited lifespan, as we've seen in past articles, so if these large quantities are to have a meaningful purpose, one might surmise the strategy for these notes to bridge the need for useful denominations during a switch from using the dollar to the dinar may not be too terribly far from happening. That said, in the earlier article, the reason behind this was said to be to replace damaged notes. Let's watch this carefully! Thank you timmie and thank you Shredd for your continued efforts to keep us informed! So our 1000 dinars, 500 dinars and 250 dinars need to be converted to dollars before they are no good? Godschild53 wrote: So our 1000 dinars, 500 dinars and 250 dinars need to be converted to dollars before they are no good? No, no, no. Your notes are not being discontinued and destroyed (unless you somehow have Saddam notes!). LOL no and thank you for responding as I (and probably others) was concerned.